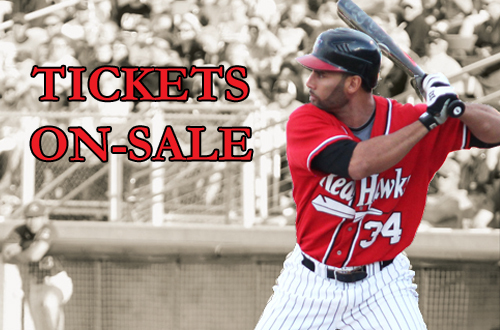 Single game tickets are now on sale at the RedHawks Ticket Office and online. Get tickets to the Home Opener, Fan Appreciation Night, or any game in between. Fans can start purchasing individual tickets and redeeming Flex Pack vouchers at the RedHawks Ticket Office. Ticket Office Hours are Monday – Friday from 10:00 am until 6:00 pm, and Saturdays from 10-1. The 2013 Schedule is packed with great opponents and a fun-filled promotions schedule. Click here to see the 2013 promotions. Reserved tickets to all 50 home games, plus all exhibition home games. Season Ticket Exchange policy—no season tickets go unused! Exchange your tickets in advance for other reserved tickets. If you miss a game, unused Season Tickets can be swapped for General Admission tickets! Select to pay in full or select Deposit to pay the $50 deposit and have the balance billed out. If you have any questions or are ready to order contact Director of Ticket Operations Michael Larson at 701-478-9206 or via email at mlarson@fmredhawks.com. The 2013 Flex Packs are now available! Flex Packs contain 13 ticket vouchers good for any game during the 2013 Regular Season. Fans can choose between the traditional Flex Pack Voucher Book, which contains paper vouchers redeemable at the RedHawks Ticket Office, or a Paperless Flex Pack. With the Paperless Flex Pack you receive a Membership Code from our online ticket service ETIX that allows you to select and print your tickets from home through fmredhawks.com. Click here for more information or to order your Flex Pack. There's no better way to enjoy a group outing than right here at Newman Outdoor Field! RedHawks baseball offers some of the most unique and exciting entertainment in the Red River Valley. Monday – Friday 10am to 6pm.